Lovely Couple? Sure, why not? He was great fun, always cutting up. He had been a bomber pilot during the war. A man of action. And she was ‘just the sweetest thing’. Linda wrote that on the photo after we left their house New Year’s Day. Christmas was good but we stayed too long. I think they were glad to see us go. Not really, maybe, but at least they could get back into their routines. He palled around with his buddies and took the dog for a walk – any excuse to be ‘someplace else’. She sat alone a lot. She didn’t really care too much for TV. She couldn’t hear it very well and he complained if it was too loud. “Makes the dog nervous,” he said. She had taught herself to crochet but no one really wanted the doilies she made. Not even her. But it was something to do. She loved that crazy light fixture. She mentioned she would like a new lamp and we gave it to her one Christmas as a joke. “Mom, this is your booger prize,” Dad told her when we put the box in her lap. She had him hang it in a place of pride. “I think of you all when I see it”, she said. We never knew if that was good or bad. We didn’t know he had a little something on the side until the funeral and “she” showed up. Grandmother knew. She had known for years. She was gracious to the lady. We stayed out of it. Even Dad. “I gave him a lot”, she said, “but not everything he wanted. Why should I deny him a little happiness?” Relationships find their level. Lovely Couple? Sure, why not? She set the picture gently on top of the others that were fanned out around her in a circle on the floor and curled her wrinkled hands over each other in her lap. She looked like a giant centerpiece meant for the dining room table. “Sometimes you have to take a chance and hope for the best,” she said, a hint of sadness hanging from the edges of her words now. I looked at her hands, the hands that had painted the only picture she took with her when she left California with my grandpa, the one that hung on my bedroom wall, the one I had discovered and stolen from piles of clutter meant for a yard sale. She looked at the Polaroid then buried it under the others. 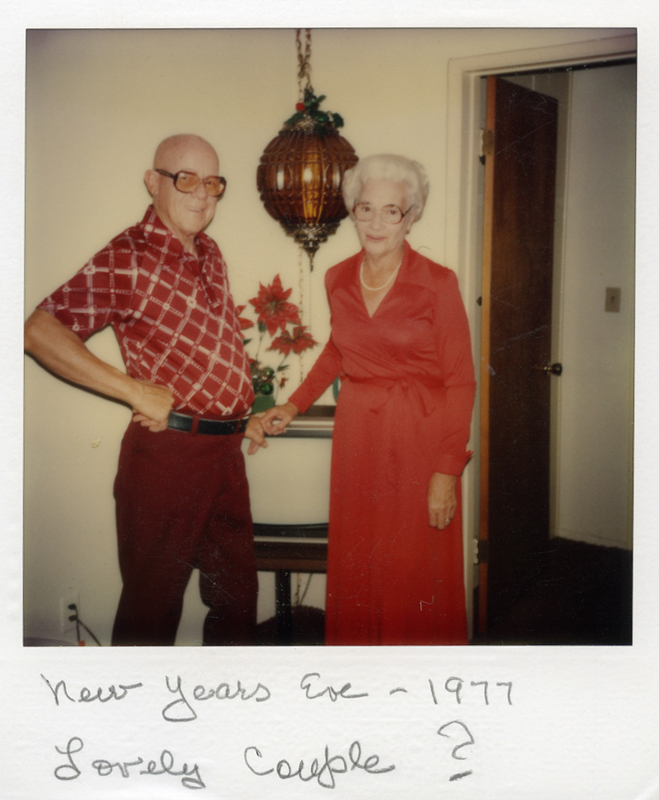 “But he was a hell of a dancer,” she said again and began sorting through another box of pictures.